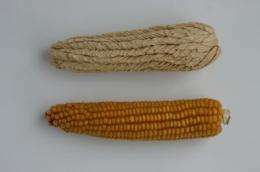 In a variant of maize known as pod corn, or tunicate maize, the maize kernels on the cob are not 'naked' but covered by long membranous husks known as glumes. According to scientists from the Max Planck Institute for Plant Breeding Research in Cologne and Friedrich Schiller University in Jena, this variant arises from the activity of a leaf gene in the maize cob that is not usually active there. Thus, pod corn is not a wild ancestor of maize, but a mutant that forms leaves in the wrong place. The putative significance of pod corn for the domestication of maize has long been a matter of controversy. Some scientists believed pod corn to be a wild, precursor of the varieties with naked kernels common today. Others disagreed with this view  and they were right, as we now know. The wild ancestor of today's common maize varieties is not pod corn but the unimpressive sweet grass teosinte. Heinz Saedler, Günter Theißen and their colleagues have now discovered how the spectacular appearance of pod corn arises. Their findings reveal that this variant has nothing to do with the domestication of maize, but is a mutant that forms leaves in the wrong place. Genetic experiments from the 1950s provided important inspiration for the research. "We knew from the old crossing experiments that the mutation must consist of at least two genetic components that can be inherited separately. If just one component is inherited, the glumes that surround the kernels in this mutant are significantly smaller and less conspicuous than the glumes in mutants with both components. However, they are not as tiny as the glumes found in common maize plants in which the kernels sit naked on the cob," explains Heinz Saedler from the Max Planck Institute for Plant Breeding Research. The researchers succeeded in showing that the components in question are two copies of the same gene which are located in tandem on chromosome 4. Although the gene itself is intact in pod corn, the region that controls the transcription of the gene is damaged. As a result of this defect, spatial control of gene activity in the right plant organs is lost. Therefore, in its mutated form, this gene is also active in the cob and not only in the growing leaves. "The gene contains the information for a transcription factor. Through its ectopic activity in the male and female inflorescence, it controls a set of so called 'target genes' and hence a programme in the glumes that is normally reserved for leaf development and should not be active in the inflorescence. As a result of this erroneous activity, the glumes assume a leaf-like growth pattern and grow until the kernels are completely covered," says Günter Theißen from the University of Jena. These findings also explain the existence of pod corn with smaller glumes. "The extent of this phenotype depends on whether there are one or two copies of the damaged gene on the chromosome and whether the plant is homozygous or heterozygous for this gene," says Theißen. "If one gene copy is present, the effect on the leaf development programme is only half as strong as it is in one with two copies. Therefore this genetic effect is additive. The gene dosage decides, on the strength of the mutant phenotype." Theißen and his colleagues were also able to show that the mutated gene belongs to an entire family of developmental control genes known as the MADS-box gene family. Other representatives of this family control other development processes in the plant. Since other members of the grass family, such as wheat, have glumes covering the seeds on the inflorescence, I would be interested in knowing if genetic studies on these plants have also been done and the results compared to the results here. Two copies of a gene is more likely, to me, to be abarrant, but one copy of the gene may still indicate a maize type closer to the ancestral plant.